Control of the House of Delegates is at stake. A win by Yancey in the race would give Republicans enough votes to pick the next speaker when it meets on Wednesday. “At this moment, I am not conceding,” she said. Yancey, the incumbent Delegate for the seat, did not make the trip to Richmond for the 11 a.m. drawing, however several Republican staffers attended. The State Board of Elections used a blue, stoneware bowl created by Virginia artist Steven Glass for the important drawing. The canisters were swirled and one selected from the bowl by Board Chair James Alcorn. State law calls for tie elections to be decided by “drawing lots” — a process that is used on a regular basis to decide the ballot order for elections in the state. But the last drawing to break a tie in a House pf Delegates race was held in 1971. Never before, however, has a tie determined who would be the speaker of the House. “Today we have witnessed an unprecedented event in the history of the Commonwealth of Virginia, said Board member Clara Belle Wheeler. The decision comes after a reversal of fortunes for both candidates. Yancey appeared to be the winner in the race after Election Day, nearly two months ago. Then Simonds believed she had won the race by one vote the day ballots were recounted. The next day, a three-judge recount court counted one additional ballot for Yancey, creating the tie in the race at 11,608 votes. Despite big gains by Democrats in the November election, Republicans are likely to control the House by a margin of 51-49, giving them the ability to set rules, pick committee chairs and ultimately decide what bills make it to the floor for a vote. 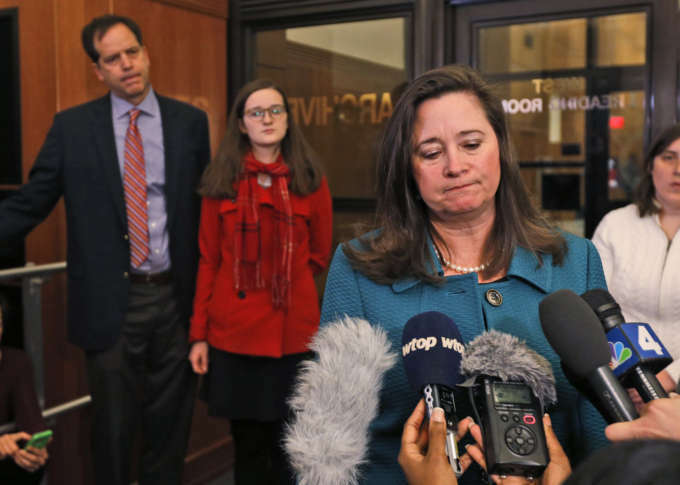 But House Republican Leader Kirk Cox told The Associated Press shortly after the drawing that if Simonds pursued a recount, neither Yancey or Simonds would be seated until a winner was finalized. That would still allow Republicans to elect a speaker and make committee assignments based on a 50-49 advantage. However another race in Stafford County and Fredericksburg remains disputed and could alter the balance of power again. Democrats hope to block Republican Bob Thomas from being seated. A hearing is set for Friday in federal court. WTOP’s Max Smith contributed to this report from Richmond.